Today was a pretty day here -- cool, breezy, and sunny on and off throughout the day. Hubby had a meeting to attend most of the day, which left me time to shop and play around in the kitchen! I decided to get a head start on dinner to have it ready beforehand so hubby and I could take our walk before dinner and it would be waiting for us when we got done. 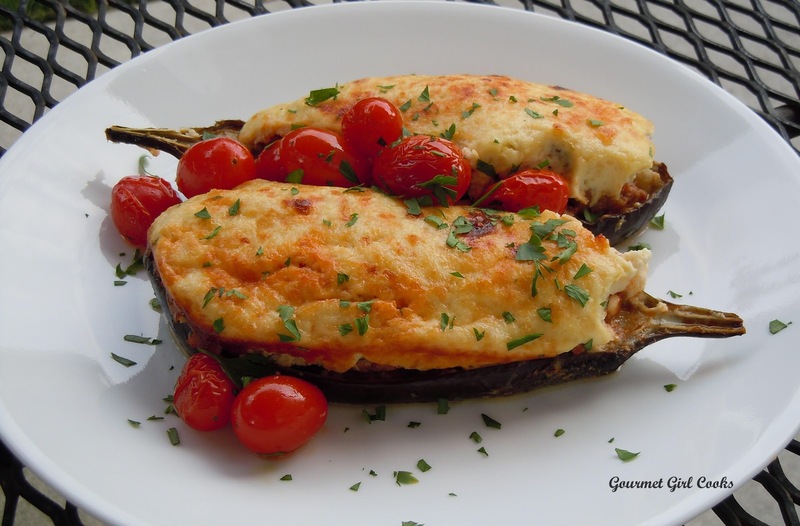 I had 5 beautiful small Italian style eggplants that I wanted to do something with...so I decided to convert them into Mini Stuffed Moussaka Boats...Greek food is one of my favorites -- everything is so fresh. Instead of layering the moussaka in a casserole the traditional way, I decided to halve the small eggplants, roast them, scoop out the eggplant flesh and make the traditional meat filling, mixed in with the chopped eggplant pulp, some feta cheese and then stuff it all back into the hollowed out eggplant shells, top with my grain free "bechamel sauce" and bake. 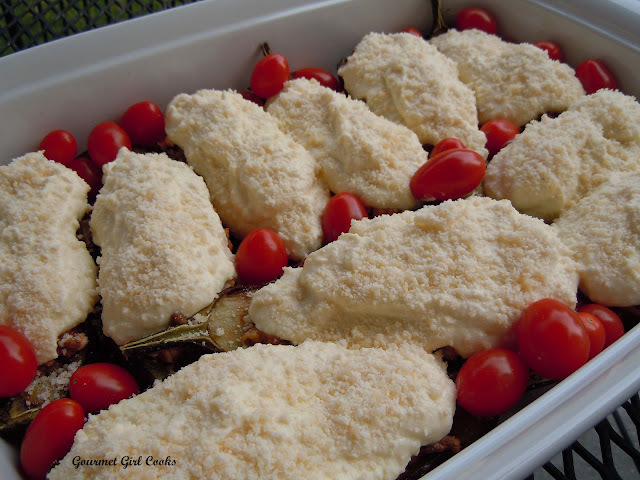 I tossed in a couple handfuls of fresh grape tomatoes to roast along with the Mini Stuffed Moussaka Boats. They turned out delicious and made a beautiful presentation when served. I snapped a few photos below for you to see along with the recipe. Enjoy! 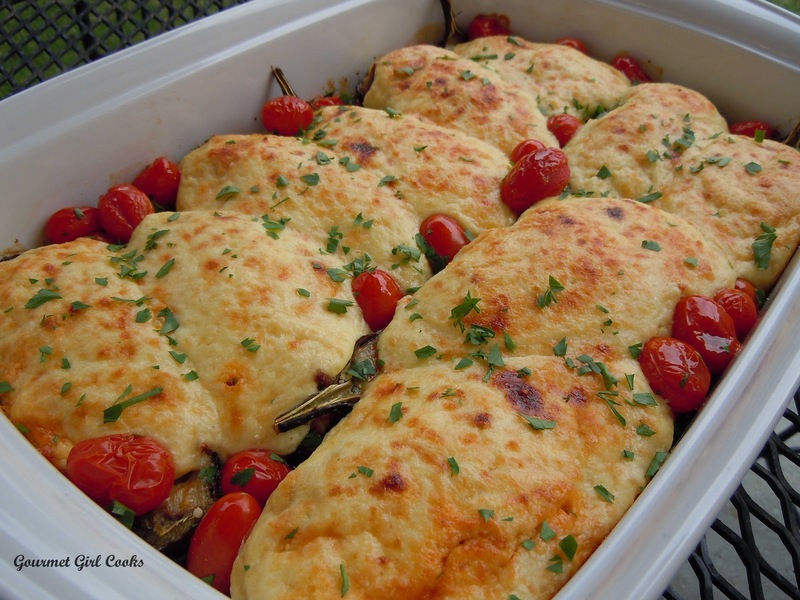 Preheat oven to 400 degrees F. Lightly brush bottom of a 9" x 13” baking dish or similar sized casserole dish with olive oil and set aside. 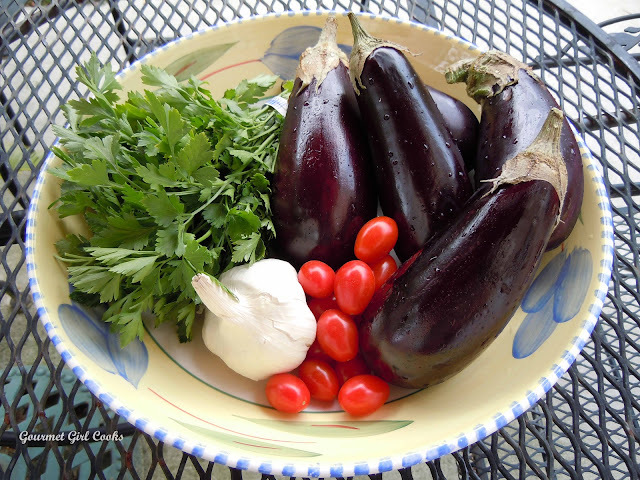 Place halved eggplants on a baking sheet, cut side up; brush cut side with olive oil and season with salt to taste. Bake for 20 minutes or until flesh is fork tender. Let cool for a few minutes until cool enough to handle. Using a spoon, scoop out eggplant flesh, leaving a very thin wall of flesh against the eggplant's skin so they maintain their shape and can be stuffed. Chop the eggplant flesh and set aside (it will be added to the cooked meat mixture later). In a large skillet, brown beef; add onions and cook stirring until the beef is no longer pink and the onions are soft and translucent; add garlic and cook a few minutes more. Add tomato sauce, oregano, cinnamon, 1/2 teaspoon salt (to taste), black pepper (to taste) and fresh parsley; simmer uncovered about 10 minutes (you don’t want much liquid left). When liquid is almost completely gone, remove from heat; cool for about 10 minutes while you prepare the bechamel sauce. Bechamel/Cheese Sauce: In a medium bowl, whisk ricotta, eggs, 1/2 cup Parmesan cheese and dash of nutmeg together until smooth and well blended; add salt and pepper to taste, if desired (the Parmesan cheese is salty, so be careful not to over salt). 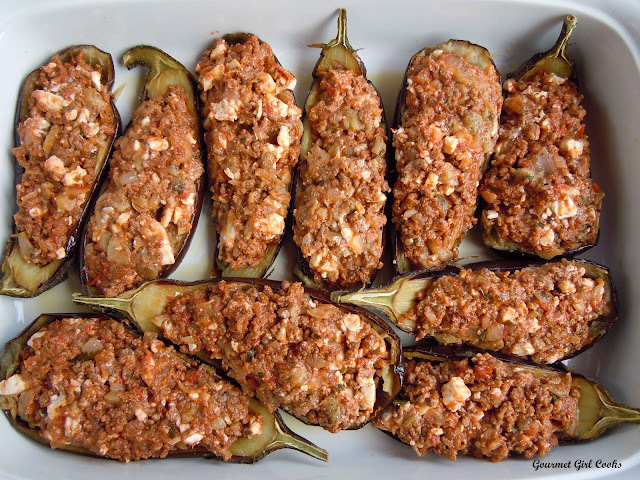 Stir the feta cheese and the chopped cooked eggplant flesh into the meat mixture. 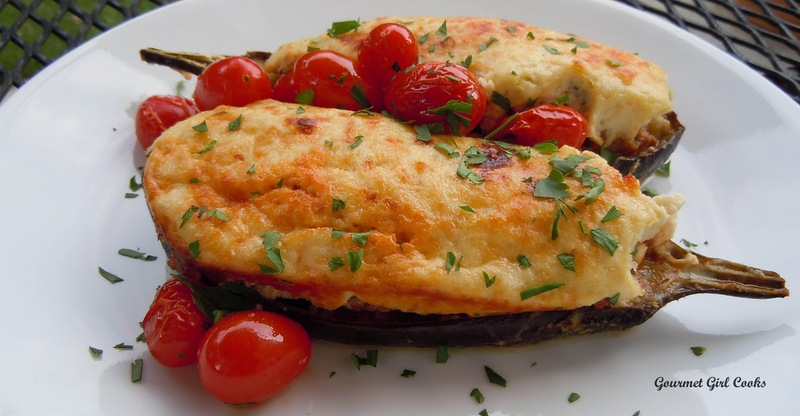 Using a spoon, divide the filling evenly between the eggplant shells and fill until slightly mounded. Place filled shells in prepared baking dish. Spoon bechamel sauce on top of each filled eggplant half and lightly spread it to cover the meat filling. Lightly sprinkle additional Parmesan cheese on top of each, if desired. Bake in a 350 degree oven for 35 to 40 minutes. If desired, run under the broiler for a few minutes to lightly brown the tops. Let sit about 10 minutes or so to set. Serves approximately 4 to 5. *Note: Even though you may not think 8 ounces of tomato sauce is enough; the tomato sauce is simply being used to flavor the meat and keep it moist, it isn't supposed to be like lasagna's meat sauce. If you don't like the idea of adding cinnamon to the meat mixture, you can omit it; however it is the unique flavor that I think "makes this dish". 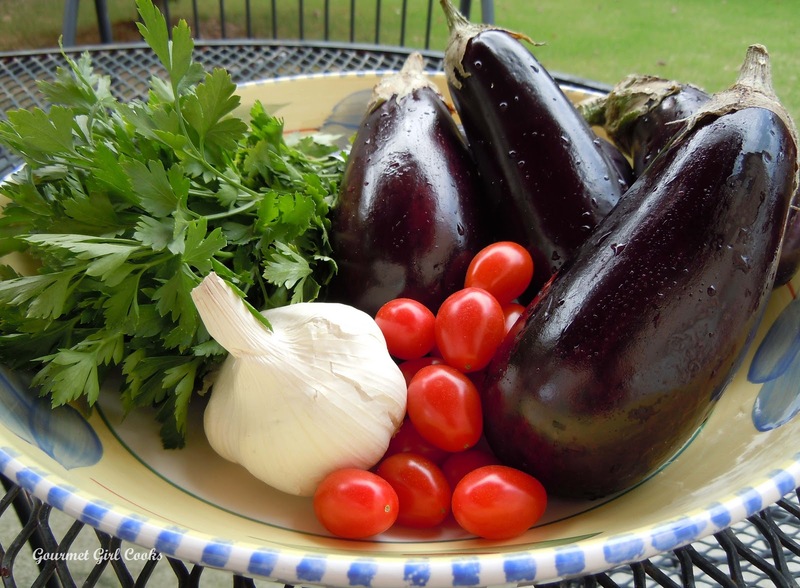 Also, it is imperative to cook your eggplant until completely fork tender -- this is not a vegetable that is pleasant undercooked (unless you like chewing on erasers). ALL I CAN SAY IS WOW! Looks great and what a fun idea to have individual moussakas! 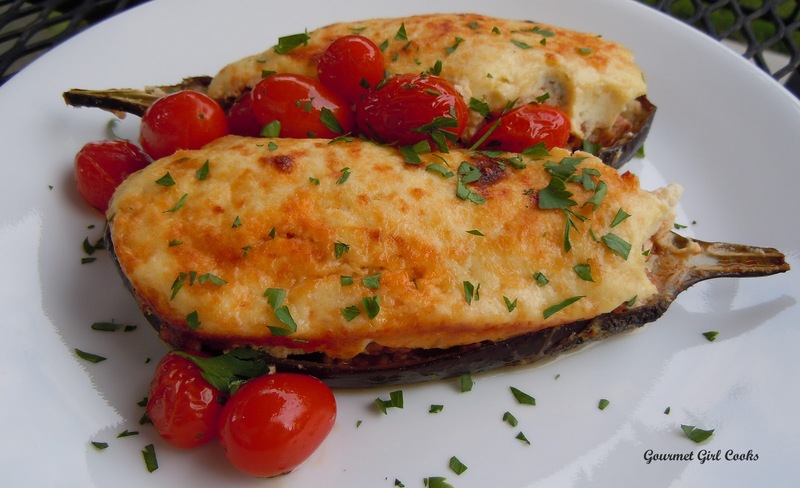 mini moussaka mini moussaka mini moussaka - say that 3x fast! You continue to out-do yourself! This looks absolutely wonderful and your "still-life" photo of the ingredients is over-the-top gorgeous! There is no mention about when to add the eggplant meat that was scraped out after roasting:-) please help! Looks beautiful! I grew up eating moussaka and have been making it for years. One thing I never put in the meat mixture is oregano. I know some do, but to me it's a detraction. For me, cinnamon is not optional, it's a must. If you have a bit of good red wine, it's good to add, too. I also add a small amount of allspice about 8-10 allspice berries that I crush and I add about 6-8 whole cloves, crushed well. I also add a bit of allspice and nutmeg to the béchamel. I do like doing the individual eggplant halves, as it's less work and the taste is very good. I was wondering if these "yummies" can be made in advance and frozen? Would you cook it before freezing? Only once when serving it? Or just re-heating? Lots of company coming and this would be a terrific dish to have frozen, ready to defrost and heat! This looks lovely--and you are so right about undercooked eggplant/erasers. 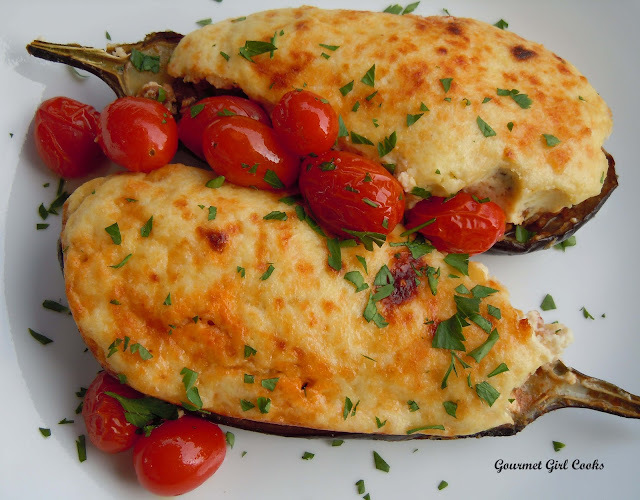 I made your eggplant ricotta bake about a week ago, and when eating it, I couldn't help but think the ricotta tasted like the bechamel topping on moussaka. So I came here to see your flour-free version of bechamel, and there it is with ricotta! Anyway, am thinking of using the ricotta bechamel as a topping for meatloaf pie. I know it will be good! Finally, I made this and it was truly wonderful excellent! Can't say enough good things. I really enjoyed it and the leftovers will be great. Do you know if leftovers will freeze well? My only concern is the ricotta topping, as I'm not sure if that will freeze ok. There won't be enough to freeze, this time, but I'd love to make more next time and freeze some. Thanks for a super terrific recipe! Hi! thanks for the recipe I just ended up trying these and they tasted fantastic. My eggplant seemed a lot more collapsed than yours and seemed like it had a lot of moisture, maybe I didn't simmer the beef long enough or the eggplant had too much water?